Can't touch this—the new 2018 Malibu 21 MLX offers rider-friendly amenities at a great price. Anyone who has shopped the tow boat market knows how expensive things can get. 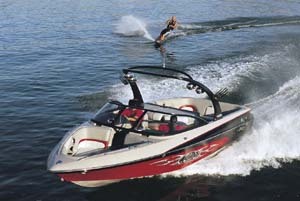 Malibu’s 25 LSV, for example, is unapologetically offered at a price of upward of $200,000. Some buyers want that, and we hope Malibu sells legions of them. Some buyers can’t afford a boat like that, but still want a premium brand. That’s where Malibu’s 21 MLX comes in. It offers the amenities and quality people seek in a Malibu, but it does so at a price that will appeal to more modestly financed buyers. How modestly is it priced? Malibu advertises that a well-equipped 21 MLX sells for $82,995, and that’s a sweet spot for a lot of buyers. If you're looking for a tow boat with all the latest bells and whistles that's still reasonably priced, the 2018 Malibu 21 MLX might just be the boat for you. 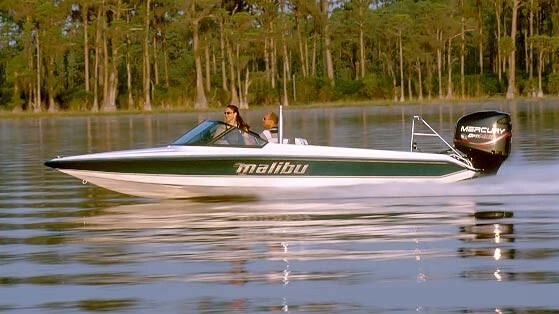 It measures just 21 feet in length, but Malibu says you can put up to 14 people on board. So much the better. 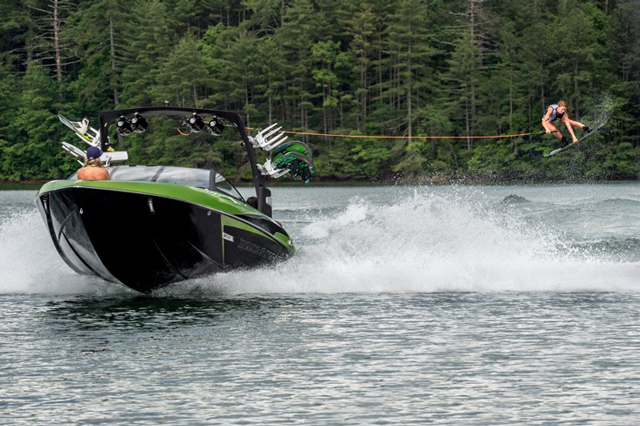 More people means more weight, which means bigger wakes, and that’s the whole point of the 21 MLS. That’s why the boat comes standard with the Power Wedge II and Malibu’s Surf Gate System (learn more in New Technology in the Watersports Boat Market Makes Waves). You also get as standard Surf Band, the wrist-mounted controller that gives the rider control of boat speed, the Surf Gate and the Power Wedge II. Now to worry, the command center on the dash lets the driver know what the rider is up to. The 21 MLX also can carry up to 3,952 pounds of water ballast in its hard-tank system. That last 2 pounds must be important. 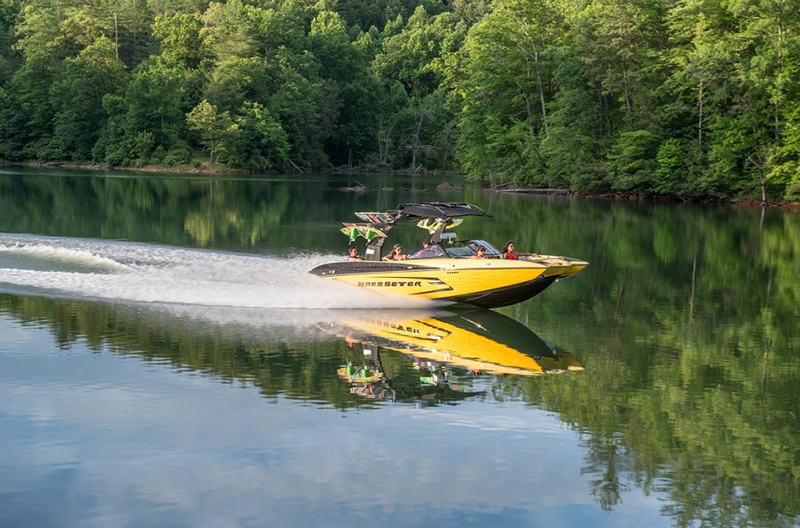 The driver can monitor and control everything from Malibu’s Viper II Command Center, a 12-inch bright, high-resolution touch screen display that gives fingertip control of the wake settings, stereo and boat speed. It's hard to believe that a 21-foot boat could hold up to 14 people—Malibu doesn't waste an inch of usable space onboard. 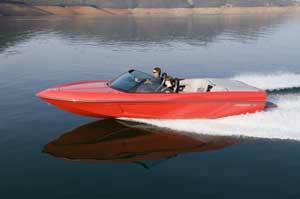 You can opt for a 450 HP engine, but that bumps the price and marine power is never cheap. The standard engine is a 410 HP Monsoon from Crusader engines. 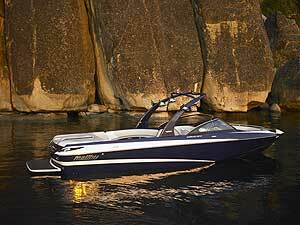 Also standard is Malibu’s G35 tower, which comes with board racks to either side and a bimini top. Snap-in carpeting comes standard as does a factory trailer and a five-year warranty. Inside, you get the fit and finish you expect in a Malibu. The bow area features a raised playpen-style design. It’s wide and comfortable thanks to the “pickle fork” design. Backrests are angled and contoured for forward- and rear-facing passengers. It’s well thought out and comfortable. At the helm, the driver’s seat mounts to the same raised platform that houses the starboard lounge and stowage compartment. That makes the driver’s seat more secure because it doesn’t sit on a pedestal mounted to the floor, which can loosen and wiggle as a boat ages. While the boat's design focuses more on accommodating the rider rather than the passengers onboard, you'll still find there's ample room in the cockpit for a big crew heading out for a day on the lake. The cockpit is simple and straightforward. The G-shape lounge wraps around the perimeter with ample floor space. The 21 MLX doesn’t have the innovative seating, such as a convertible rear bench or the side lounge backrests, but this boat had to hit a certain price point, and it’s clear Malibu focused this boat’s equipment on the rider rather than the passenger. When you consider everything the Malibu 21 MLX comes with as standard, in a market that isn’t squeamish about price tags, it’s not difficult to imagine this boat becoming a runaway hit for Malibu. It comes with the equipment focused on the rider at a price that many competing models can’t touch. See Malibu 21 MLX listings. 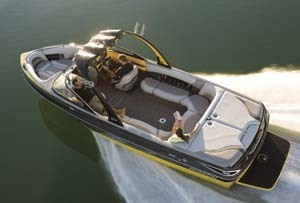 Malibu Wakesetter 22 VLX: Breaking New Ground. Again.